The Hill of Tarvit is a country house placed on the south facing slopes of Tarvit Hill around a mile and a half south of Cupar and a similar distance west of Ceres. 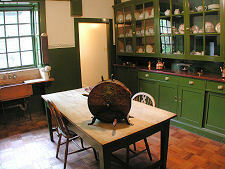 The house you see today was largely built between 1905 and 1906, and is one of the few houses designed by architect Sir Robert Lorimer to retain much of the decoration and furnishings whose selection he felt to be such an important part of the architect's role. 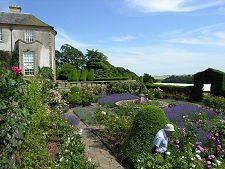 Hill of Tarvit is owned and cared for by the National Trust for Scotland. 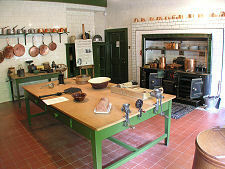 To celebrate the house's centenary in 2006 the NTS restored it as closely as possible to its original state in 1906. For the visitor this means that Hill of Tarvit has become a time capsule, capturing the essence of a way of life long gone, but still almost familiar: life as lived by people only a generation or two removed from older visitors. Since we took the photographs to illustrate this page, the house has been painted white. We will update our images after we have revisited. And what makes a visit all the more interesting is that Hill of Tarvit gives an insight into the lives of everyone who would have lived and worked here. 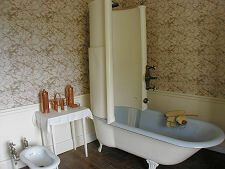 The state of the art accommodation enjoyed by the Sharp family for whom the house was built is all on view. But so is much of the "below stairs" detail in the older rear service wings: especially in the kitchen and pantry. 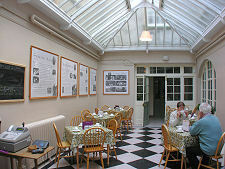 The rear wings also accommodate Hill of Tarvit's excellent tearoom and shop. 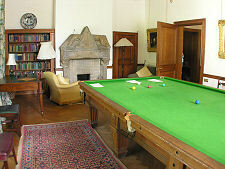 Surrounding Hill of Tarvit are some 279 acres of gardens, woods and parkland. The estate is open all year round and those visiting can enjoy gardens ranging from the formal to the informal, from the rose garden to the kitchen garden and orchard. A waymarked Centenary Walk reveals much the estate has to offer and takes you to the top of the 211m high Tarvit Hill, and to the estate's doocot, probably dating back to the late 1700s. It may seem odd for a house built in 1906 to come complete with a doocot from the 1700s. The truth is that the story of Hill of Tarvit is actually far more complex than it at first appears, and the house you see today is only the latest in a series of dwellings in the area that between them stretch back some two thousand years. The first was an Iron Age homestead whose remains have been found close to the top of Tarvit Hill, in use for a period between 200BC and AD200. Excavations in 1946-7 revealed evidence of an elaborate 17m diameter circular wooden house within an oval bank enclosing an area of 33m by 27m. 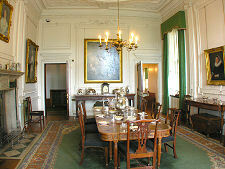 It seems the site was occupied long enough for the house to need rebuilding twice after its original construction. Fast forward to 1500, when the Inglis family of Tarvit constructed Scotstarvit Tower on a site half a mile southwest from Hill of Tarvit. This tower house was to become the focus of the estates of the Inglis family, which they sold to Sir John Scott of Scotstarvit in 1611. He rebuilt much of the tower in the 1620s: an elaborate chimneypiece from the tower carrying the date 1627 forms the fireplace in Hill of Tarvit's smoking room. By 1696 the estate was known as Unthank and the laird at the time, John Wemyss of Unthank did what many lairds of his day were doing. He turned his back on a tower house designed primarily for defence and engaged an architect, possibly Sir William Bruce, to design a mansion house. 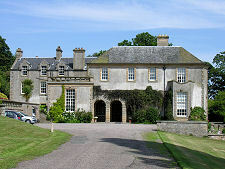 This, with due modesty, he named Wemyss Hall and it stood where Hill of Tarvit stands today. During the following two centuries two service wings were added to the north or rear side of Wemyss Hall, one during the 1840s. 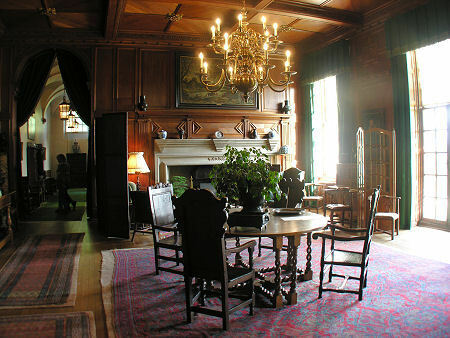 In 1904 Wemyss Hall and its 1,223 acre estate were purchased by Frederick Bower Sharp. Sharp came from a wealthy family of jute mill owners in Dundee, and had diversified into venture capital and transport interests. He wanted a family home with good rail access to Dundee and reasonably close to St Andrews, where he was a keen member of the Royal and Ancient Golf Club. 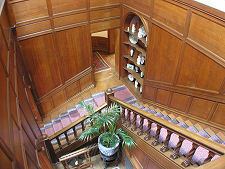 He also wanted somewhere suitable for his important collection of paintings, tapestries, furniture and porcelain, and while Wemyss Hall met the requirements in terms of location, it fell short in terms of accommodation. 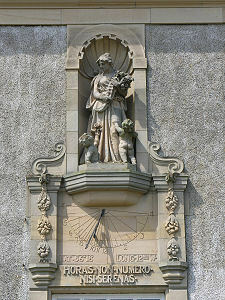 He therefore engaged the architect Sir Robert Lorimer to produce something more suitable. 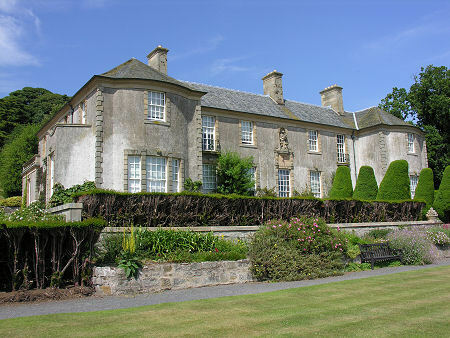 Over the following two years the main block of Wemyss Hall was replaced by Hill of Tarvit, though the rear service wings from the earlier house were retained. The new house came complete with electricity, an internal telephone system and central heating. In 1924 Sharp had the 9-hole Kingarroch Golf Course laid out to the south of the house: the NTS has reinstated this, and it can again be played using vintage hickory clubs. Frederick's only son, Hugh Sharp, was born in 1897. He served with distinction in the artillery during the First World War, and was awarded a clutch of medals including the Military Cross. Frederick died in 1932, leaving a great deal of money to good causes, and his extensive business interests to Hugh. 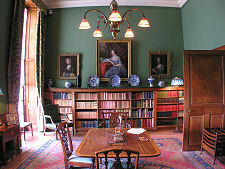 Hugh built up an extensive collection of rare books at Hill of Tarvit, was an expert and enthusiastic sportsman, and travelled widely collecting botanical specimens, many of which still thrive in the gardens at Hill of Tarvit. In 1937, at the age of 40, Hugh became engaged to Mabel Hogarth, daughter of a shipping family. On 10 December 1937 he was travelling to meet Mabel in Glasgow, at her insistence by rail rather than by car because of a snowstorm, when he was among the 35 people killed when the Edinburgh to Glasgow express ran into a stationary train at Castlecary near Falkirk. 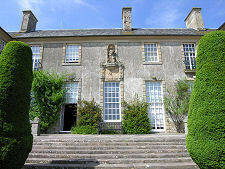 Hugh's mother Beatrice and his sister Elisabeth continued to live at Hill of Tarvit until Beatrice's death in 1946, and Elizabeth's, of cancer, two years later in 1948. 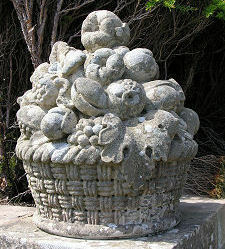 Elisabeth left the house and estate to the National Trust for Scotland, plus the family's collections and an endowment to finance their upkeep. Hugh's remarkable book collection had been presented to the National Library of Scotland after his death. 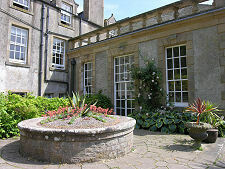 For thirty years the NTS provided for viewing of the ground floor of Hill of Tarvit by appointment only, with the upper floor used as a convalescent home by the Marie Curie Foundation. 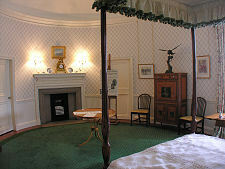 Since 1977 the whole house has been open to the public.